For other uses, see Stable (disambiguation) and Stability (disambiguation). Look up stable in Wiktionary, the free dictionary. A horse in a box stall. A stable is a building in which livestock, especially horses, are kept. It most commonly means a building that is divided into separate stalls for individual animals. There are many different types of stables in use today; the American-style barn, for instance, is a large barn with a door at each end and individual stalls inside or free-standing stables with top and bottom-opening doors. The term "stable" is also used to describe a group of animals kept by one owner, regardless of housing or location. The exterior design of a stable can vary widely, based on climate, building materials, historical period and cultural styles of architecture. A wide range of building materials can be used, including masonry (bricks or stone), wood and steel. 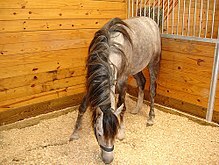 Stables also range widely in size, from a small building housing one or two animals to facilities at agricultural shows or race tracks that can house hundreds of animals. The stable is typically historically the second-oldest building type on the farm. The world’s oldest horse stables were discovered in the ancient city of Pi-Ramesses in Qantir, in Ancient Egypt, and were established by Ramesses II (c.1304-1237 BC). These stables covered approximately 182,986 square feet, had floors sloped for drainage, and could contain about 480 horses. Free-standing stables began to be built from the 16th century. They were well built and placed near the house because these animals were highly valued and carefully maintained. They were once vital to the economy and an indicator of their owners' position in the community. Relatively few examples survive of complete interiors (i.e. with stalls, mangers and feed racks) from the mid-19th century or earlier. 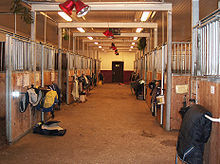 For horses, stables are often part of a larger complex which includes trainers, vets and farriers. "Stable" is used metaphorically to refer to a group of people – often (but not exclusively) sportspeople – trained, coached, supervised or managed by the same person or organisation. For example, art galleries typically refer to the artists they represent as their stable of artists. Historically, the headquarters of a unit of cavalry, not simply their horses' accommodation, would be known as "a stable". Traditional style barn, built 1802, still used as a horse stable. A modest stable with a few stalls. A shed row-style stable at a riding club in Panama. Stables of the Einsiedeln Abbey, Switzerland. A horse stable, over 100 years old, still in use. A row-style stable in Žabnik at Sveti Martin na Muri, Croatia. Media related to stables at Wikimedia Commons. ^ "Oldest horse stables". Guinness World Records. Retrieved 2016-06-27. ^ England, Historic. "Historic Environment Local Management Training Programme - Historic England". www.helm.org.uk. Retrieved 19 April 2018. ^ The Conversion of Traditional Farm Buildings: A guide to good practice (English Heritage publication). ^ "The Barn Guide by South Hams District Council". southhams.gov.uk. Archived from the original on 14 July 2014. Retrieved 19 April 2018.